The store is located on Avenida Monte Igueldo 3, on the corner of Avenida de la Albufera, in Puente de Vallecas. Fundación Pueblo para Pueblo, a non-governmental organization for development (NGO) that assists in the financing of cooperation projects in Africa, Latin America, and Asia through the collection, sorting, and sale of used clothing, today, May 6th, opened its seventh secondhand clothing store in Madrid at Igueldo Monte Avenue 3, on the corner of Avenida de la Albufera, in Puente de Vallecas, in the heart of Madrid. The new store has two floors and 200 square meters which house clothing, footwear, and accessories for men, women, and children, as well as textiles for the home. This establishment, like the 20 other stores run by Humana in Spain, is directed at three types of customers: first and foremost, those seeking a certain quality of clothing at a low prices, i.e. people with an average purchasing power and a taste for quality clothing, such as youth or immigrant populations; second, those who want to collaborate with the Fundación's development cooperation projects; and third, those looking for unique and special items. On the occasion of the new store's opening, all items for sale had a special price of 4, 3 or 2 euros. More than a hundred people passed through the store during its first hour of being open to the public. The items on sale at the new store come from the approximately 18,000 tons of clothing and footwear that Humana collects every year in more than 3,650 containers in Spain. Garments deposited by donors into the containers and at the shops have two destinations: one part is sent to the sorting plants that Humana has at L'Ametlla del Vallès (Barcelona), Leganés (Madrid) and Valderrubio (Granada), while the rest is sold to recycling companies. -40% of the classified items are sent to Africa to be sold cheaply to local merchants in order to meet the demand of these countries, promote local economic activity, and generate resources for development. 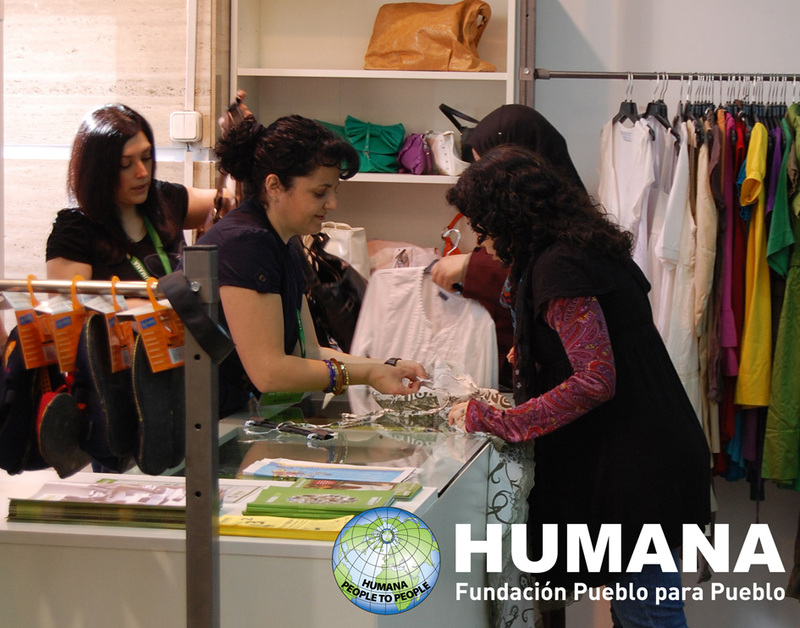 - 12% of classified clothing goes to the 21 secondhand Humana stores in Spain. - Approximately 30% of the garments cannot be reused and are therefore sold to textile recyclers. The remaining 18% is sent to landfills, as it cannot be reused or recycled due to its quality. The proceeds from the collection, sorting, and sale of donated clothing allows the financing of development cooperation projects in Africa, Asia and Latin America. Each kilo of clothing collected converts to approximately 8 cents for these projects. This is noteworthy, assuming that 1,500 euros can train a primary school teacher who will teach 50 children each year for an average of 30 years. Simultaneously, textile recycling contributes to environmental protection by partially reducing the volume of waste generated, giving a second life to a garment that would otherwise go to a landfill. Reusing clothing and footwear also reduces the consumption of natural resources (such as water or fossil fuels), as well as fertilizers and pesticides used in the manufacture of textiles. In addition, reusing or recycling textiles also reduces CO2 emissions.